You are currently browsing jordivitria’s articles. 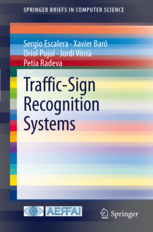 New Book: Traffic-Sign Recognition Systems. 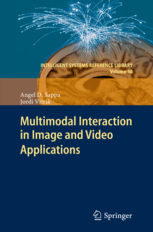 We have published a new book: Escalera, S., Baró, X., Pujol, O., Vitrià, J., Radeva, P. Traffic-Sign Recognition Systems. Sringer. Series: SpringerBriefs in Computer Science. 2011, ISBN 978-1-4471-2244-9, based on our work in a long coordinated project with the Institut Cartogràfic de Catalunya. This work presents a full generic approach to the detection and recognition of traffic signs. The approach, originally developed for a mobile mapping application, is based on the latest computer vision methods for object detection, and on powerful methods for multiclass classification. The challenge was to robustly detect a set of different sign classes in real time, and to classify each detected sign into a large, extensible set of classes. To address this challenge, several state-of-the-art methods were developed that can be used for different recognition problems. Following an introduction to the problems of traffic sign detection and categorization, the text focuses on the problem of detection, and presents recent developments in this field. The text then surveys a specific methodology for the problem of traffic sign categorization – Error-Correcting Output Codes – and presents several algorithms, performing experimental validation on a mobile mapping application. The work ends with a discussion on future lines of research, and continuing challenges for traffic sign recognition. You can get your copy at Amazon and Springer! The ICMI 2011 deadline, for papers and demonstrations and exhibits, is near. Don’t miss it, it will be a great conference! Iberian Conference on Pattern Recognition and Image Analysis, which will be held in Las Palmas de Gran Canaria (Spain), June 8-10, 2011. The deadline for proposals has been extended until November 29th. 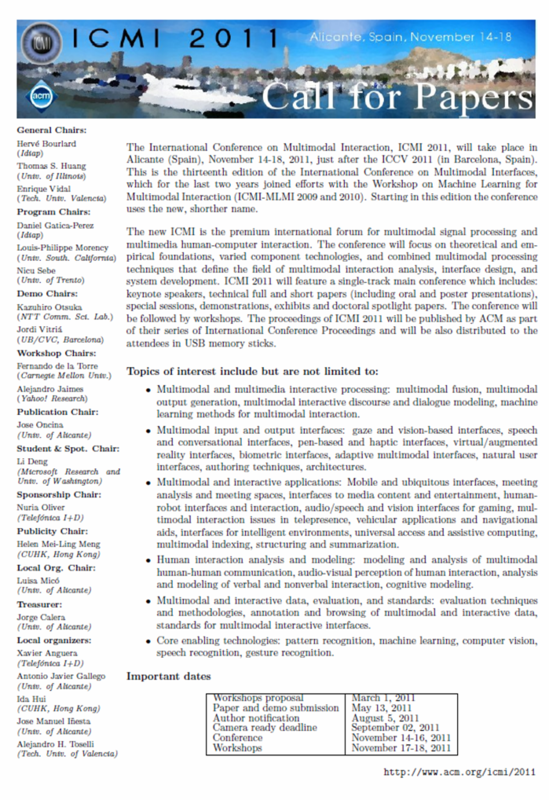 The 13th International Conference on Multimodal Interaction, ICMI 2011, will be held in Alicante, Spain, 14-18 November 2011. Our group is involved in the organization. We expect a great success for this conference!